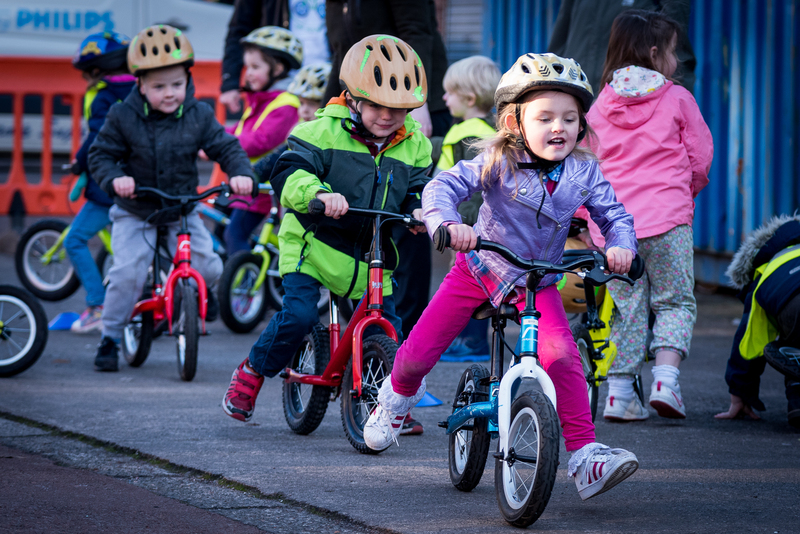 Play on Pedals aims to give every preschool child in Glasgow the opportunity to learn to ride a bike before starting school. The project was supported by players of People’s Postcode Lottery and awarded £231,000 by the People’s Postcode Dream Trust Fund (1), the largest single award given by the fund at that time. Play on Pedals (2) was a partnership project between Cycling UK (3), Cycling Scotland (4), The Glasgow Bike Station (5) and Play Scotland (6). Play on Pedals partners recognised how cycling can provide a means of independence, an opportunity to develop new skills and a low-cost way to maintain a healthy lifestyle. It has both physical activity and mental health benefits, is sustainable, inclusive and fun; by engaging children and young families in cycling, Play on Pedals aimed to have a transformational effect on future generations in Glasgow. Glasgow is a city with large areas of multiple deprivation and recognised health inequalities. The Glasgow Centre for Population Health (GCPH) has released data sets for Children and Young People, which highlight health and wellbeing, educational, environmental and socio-economic inequalities across neighbourhoods in Glasgow, as well as between Glasgow and the rest of Scotland (7). Evidence includes higher levels of child poverty in Glasgow than the rest of Scotland, in some areas as many as 46% of children live in poor households compared to the 29% average across the city. There is a recognised lower healthy life expectancy for both males and females in Glasgow than the rest of Scotland, and high inequality in healthy life expectancy across Glasgow’s neighbourhoods with a 21 year age gap in female healthy life expectancy at birth. Active travel to schools varies across neighbourhoods in Glasgow, with some neighbourhoods where only 15% of children walk, cycle or skate to schools, whereas as other neighbourhoods report figures as high as 79% of children. Levels of active travel can impact upon other indicators, notably levels of child obesity and physical activity in childhood. Regarding physical activity and obesity in children, the GCPH notes that the 2015 Scottish Health Survey reported that 28% of children aged 2 – 15 years old were overweight and 15% were obese; in Glasgow, during 2012 -2015 period roughly 6% of primary 1 children were found to be obese. Recommendations argue that solutions to tackling obesity in children should be holistic; tackling living environments, access to physical activity, diet and providing long-term, cost-effective support for families and educational settings to bring about change. Play on Pedals addressed these health inequalities by providing a sustainable, accessible and engaging project for all children across Glasgow. The project was closely linked to the Scottish Government’s Early Years Framework (8) and Getting It Right For Every Child (9) approach, as well as the national Play Strategy and Glasgow City Council’s Cycling Strategy. Play on Pedals worked with 7,148 children during the 2.5 years of the project and trained 388 Instructors and Instructor Trainers across Glasgow. 182 organisations have one or more trained Instructors, delivering Play on Pedals to preschool children on an ongoing basis, including 88% of local authority nurseries; while a total of 286 organisations have been engaged in the programme. Small grants were given to 35 Hero Organisations (10) across Glasgow, enabling local groups including bike workshops and community organisations to train their staff, deliver training events, share resources, maintain bikes between establishments and organise community cycling activities for families. In total 240 community events have been delivered by Play on Pedals and its associated Hero Organisations. These events provide free physical activity for children, information for families about access to cycling and tips for maintenance on bikes. 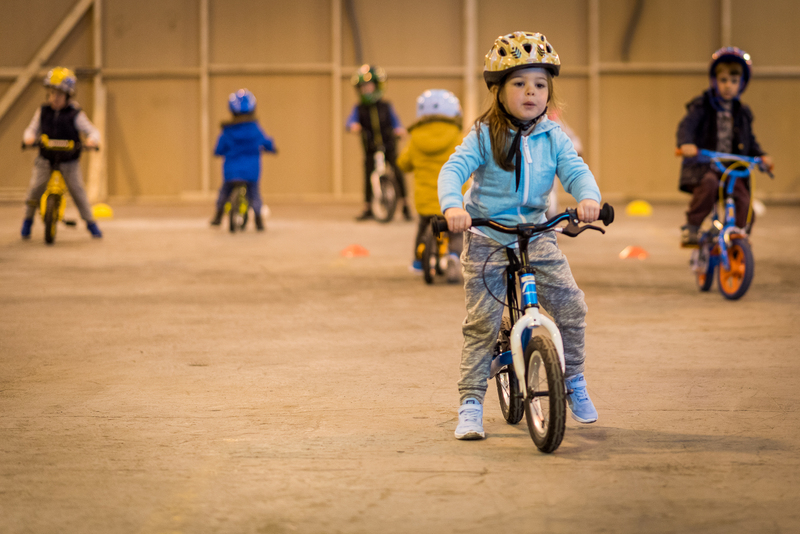 Equipment is provided and instructors facilitate a one-to-one instructional service, supporting children to learn to pedal; they are also trained to carry out basic bike safety checks for those bringing their own bikes. Additionally, 550 bikes have been gifted to participating groups through Play on Pedals, to ensure ongoing access to bikes thus reducing inequalities for low income families; this available bike fleet has been increased through two city wide second-hand bike amnesties. Bike donations have also increased the bike fleet available for groups to use, with over 100 second-hand bikes being fixed and redistributed during the project. These various approaches have enabled Play on Pedals to have a wide impact on cycling and physical activity for pre-schoolers across Glasgow. From the more structured programmes delivered in early years settings, to the informal and community focused drop-in sessions, the project has facilitated the engagement of families and their children in learning new skills, having fun, gaining confidence and increasing their physical activity levels. The project evaluation was carried out by an independent evaluator over two phases from January 2015 to December 2016. Evaluation took the form of focus groups with instructors, parents, Head Teachers and Hero Organisation representatives; tick-box observational survey measuring before and after changes to child participants’ physical and social development; online surveys for participating groups; progress forms; parental feedback forms; semi-structured interviews; group interviews; early years floor book evaluation; event evaluation; training feedback; and site visits and meetings with participating groups. Improved physical health of participants, including improved motor skills, balance, strength and co-ordination. Improved mental health and wellbeing of participants, including noted increases in confidence, self-esteem and sense of achievement. Improved relationships between peers as well as between staff and children. Improved language and vocabulary, particularly for those with English as a second language as well as improved communication skills amongst children. Increased focus, concentration, listening and perseverance has been observed in children, as well as resilience and working together as a group. Children taking responsibility and having a sense of ownership of the programme and the equipment. Supported learning about healthy eating, exercise and outdoor play. Had a positive effect on children with behavioural issues, providing a structured outdoors activity. Increased engagement in physical activities for children with additional needs and disability, including autism and hearing impairments. Provided clear pathways to linking Play on Pedals to the Curriculum for Excellence (11), enabling the inclusion of topics such as maths, problem solving, technology and literacy to be integrated. Encouraged practitioners to use new teaching methods, particularly using the outdoor environment for educational purposes as well as providing physical, practical demonstrations rather than verbal to encourage inclusion of those with limited language skills. Providing parental training sessions and opportunities to volunteer with the programme delivery. Building community links between organisations, early years settings and families. Providing regular free events and activities for families. Play on Pedals has been a hugely popular programme in Glasgow. It provided a fun and engaging way to increase physical activity, confidence and resilience amongst preschool children and families in Glasgow; as one head teacher commented, ‘There will be a generational change within the community because we have children who are leaving the nursery who can cycle and that can only add to how our environment will grow’. Linking closely to the Curriculum for Excellence and the Scottish Government’s Early Years Framework, the programme provides a structured way for early years’ settings to achieve within the Getting It Right For Every Child approach and SHANARRI indicators (12). It is now used as a tool to teach a wide range of topics and has motivated staff teams to think creatively and in new ways about how to engage children within the early years. A long-term measure of increased physical activity will be captured thanks to the inclusion of the question ‘can you ride a pedal bike?’ in the National Strengths and Difficulties Questionnaire (13) delivered to children at stages through their childhood into primary school. This, along with Sustrans’ Hands Up Survey (14) will indicate any increases in children’s cycling activities in the coming years, which may be partly attributed to children who have participated in Play on Pedals. The programme also links closely to the Glasgow City Council’s Cycling Strategy (15), with a new indicator being included in the 2016-2020 Strategy, highlighting a commitment from the Council to support partners in the provision of balance bikes to early year’s establishments. While there is a strong enthusiasm for the programme both within the early years setting and the wider community, observations from parental interviews and focus groups indicate that a lack of safe cycling infrastructure in Glasgow remains a barrier to families using cycling as a means of transport and to access green spaces. Additional obstacles include lack of safe bike storage for families to prevent bikes being stolen and financial hardships which remain a barrier to providing bikes within individual households. In order to support the progression of young cyclists to cycle to school and continue using a bike into adulthood, both as a means of leisure and as active travel, issues such as infrastructure remain important issues to tackle. Further results from Play on Pedals are awaited but from an initial impression the project has a significant effect on physical activity and engagement and has global reach.